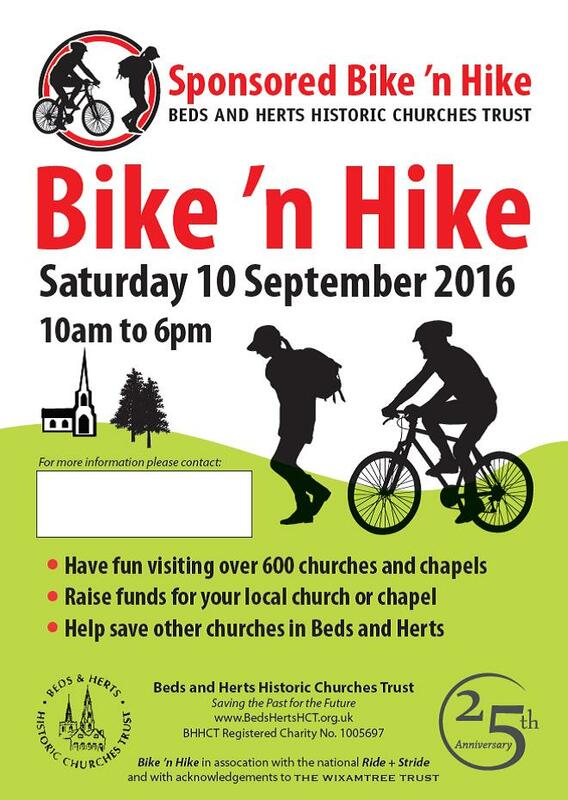 The annual Sponsored Bike ‘n Hike, organised by the Beds & Herts Historic Churches Trust, takes place on Saturday 10 September 2016. This is a good fun day for families and all who like to cycle or walk, and for those who have a competitive streak too… who can do the most? AND you will raise money, half for Holy Saviour Church and half for the Churches Trust. Sponsorship Packs for cyclists, walkers, and church helpers are available at the back of church, along with Churches Trust information. We need church helpers to welcome visitors on the day – please sign up (or email me) if you can offer an hour on the day. Gill Chidgey (gill.chidgey@gmail.com or 07576 269226).